Pasta sauce may seem like a silly thing to write a Whole30 blog post about…pasta is definitely not Whole30 compliant, so why do we need sauce? For meatballs, zoodles, spaghetti squash, parm-free chicken parmesan, and other saucy foods, of course! Tomato sauce is a beautiful, comforting thing. As long as there are no banned ingredients included, it is absolutely allowed on Whole30! Ever had a homemade sauce from a family recipe? You can really taste the love that goes into it! Even though we abstain from any grains at all on Whole30 (which means, of course, that pasta is not allowed), there are absolutely Whole30-friendly meals where we can incorporate some spaghetti sauce. Lucky for us, pasta sauce is mostly made out of things like tomatoes, onions, herbs, and spices—all of which are healthy, delicious, Whole30-friendly ingredients. 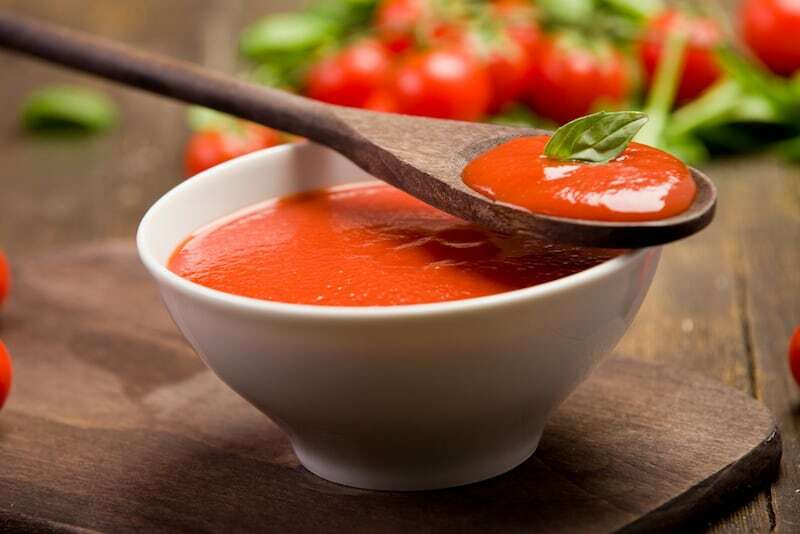 Not only is tomato sauce delicious, but its main ingredients are packed with nutritional value. Tomatoes are a very concentrated source of potassium and the antioxidant lycopene. When you think about it, pasta sauce is really just a medley of vegetable and spice goodness all pureed together! What could possibly be offensive in there? Well, especially when it comes to store-bought sauce, it is not always that simple. Pasta Sauce Ingredients To Watch Out For: Avoid These! When you are shopping at your local grocery store or online for a compliant sauce for your Whole30 dishes, there are some common additives to look out for. 1. Sugar. The number one most common Whole30-banned ingredient in pasta sauces is sugar. Since tomatoes and tomato sauce can be very acidic, people often add sugar to pasta sauce in order to counteract that sometimes overpowering flavor. 2. Non-Compliant Oils. Another thing to look for on ingredient labels is non-compliant cooking fats/oils. While most authentic sauces will use olive oil, many store-bought options may use cheaper oils like soybean or canola oil. As always, read your labels to check for any banned preservatives such as nitrites as well. These are less prevalent in tomato sauces since their natural acidity keeps them fresh for a relatively long time, but better safe than sorry! Whole30 Compliant Pasta Sauce Brands: Safe to Eat! Fortunately, compliant pasta sauces are pretty easy to come by. Check out some of our favorites below! Rao’s Homemade Marinara Sauce. This classic from an Italian restaurant in New York gets you that homemade flavor and none of the funky additives! Mario Batali Tomato Basil Pasta Sauce. Another sauce with simple ingredients and great flavor. Thrive Market Tuscan Pepper Pasta Sauce. All of Thrive’s brand name sauces are compliant with the exception of the Vodka Sauce (it has heavy cream). Grab the Tuscan Pepper sauce for some added zing! Trader Joe’s Roasted Garlic Spaghetti Sauce. For all of you Trader Joe’s shoppers out there, this is the only compliant sauce they carry, but it is both amazingly delicious and an amazing value! A great sauce is as unique as the person who makes it—the more you make your own pasta sauce, the more you will discover which slight variations you prefer. Instructions: Heat your oil of choice in a large pot over medium heat. Once warm, add your minced garlic, stirring until lightly browned—approximately one minute or so. Pour in your crushed tomatoes, add your spices and sea salt, bring to a simmer and loosely cover your sauce. Let it lightly simmer for about 15-20 minutes until the flavors have come together and you have an amazing, homemade sauce! As this sauce recipe is quite basic, feel free to add your own flair—pre-roast your garlic in the oven, add roasted red peppers, throw in some onions, or mix up the spices. What’s your favorite compliant Whole30 pasta sauce recipe? Have a secret family one you’d be willing to share? Have a favorite store-bought sauce we forgot? Tell us in the comments below! Hi there. The top three sauces you listed all have sugar, and therefore, not-compliant. 🙁 The TJ one you listed I’ve heard IS compliant, although it’s hard to find. Just FYI so you can correct your site, which I rely on heavily, as I’m sure others do as well! It might also be that you don’t understand what qualifies as sugar on Whole30. The nutrients label doesn’t matter – the sugar grams listed there occurs naturally in the tomatoes. What you want to pay attention to is the ingredient list. That’s where you don’t want to see sugar appearing – as an added ingredient. I went to Trader Joes today and the Roasted Garlic Spaghetti sauce has soy bean oil in it!! I wonder if they changed the recipe?? Aw that stinks! I guess they must have changed the recipe, what a shame. Thanks for letting us know!